Employment Growth of Aerospace & Defense Industry Cluster | Propel L.A. 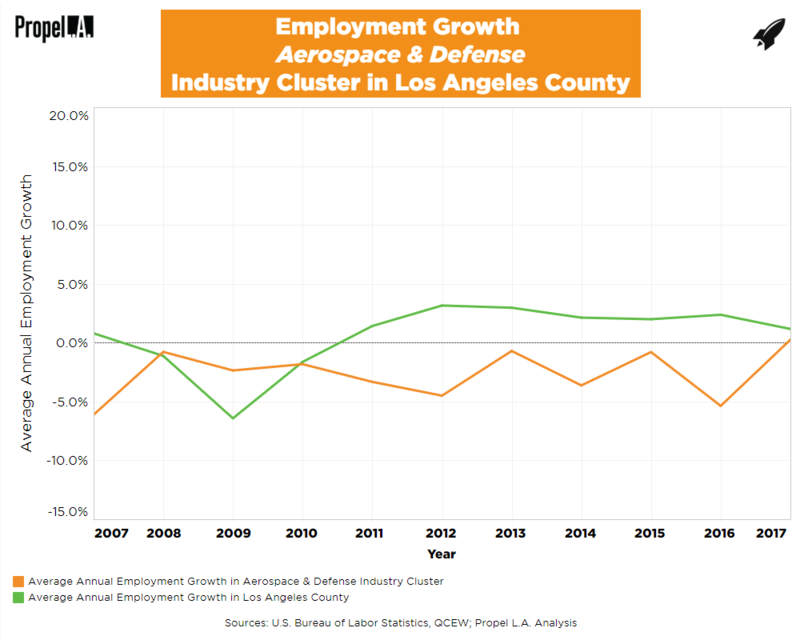 The Los Angeles County’s Aerospace and Defense industry cluster (“Aerospace”) experienced negative employment growth nearly every year, averaging around -2.7% over the past 10 years. For comparison, the green line represents the average employment growth of the whole county, irrespective of industries or clusters, which averages at about 0.6% over the past 10 years. Any rate below 0%, even if greater than the previous year, still indicates a decline in employment. Despite the decline in Aerospace employment, industry leaders believe that the sector is poised to expand under “a new generation of entrepreneurial private space companies” such as SpaceX and Virgin Galactic, and therefore, could bring thousands of jobs to the area” (Los Angeles Times, July 2016). In addition, Propel L.A. developed a two-year program with local community colleges to recruit disadvantaged individuals the into Advanced Manufacturing Training Academies (LAEDC, April 2018). The program would allowed individuals in poverty or with employment barriers in Los Angeles County to partake training in growth-oriented, high-salary career fields, including Aerospace. Annual employment growth was calculated by dividing the change in number of employees between two consecutive years by the number of employees in the preceding year within all he selected NAICS industries. Calculations only account for private ownership. NAICS industries were selected by using the definition of the industry cluster produced by the Cluster Mapping Project (CMP) developed by the Harvard Business School. To learn what is the Aerospace & Defense industry cluster or an industry cluster, read here.